ePublishing Knowledge BaseePublishing Knowledge BaseePublishing Knowledge Base Creating, Managing, and Selling Products How do I update shipping rates? 2. For multiple shipping rates and zones: If your website offers shipping via FedEx, UPS, DHL or other shipping companies, your shipper usually provides contract rates in spreadsheet format.Â Please contact your Solutions Manager to import the file automatically instead of manually updating each field in the Shipping Rate Tool.Â Your Solutions Manager can provide a sample file to ensure that your spreadsheet is set up properly for import. To create new shipping rates or for questions on shipping zones, which vary by website, please contact your solutions manager. 1. 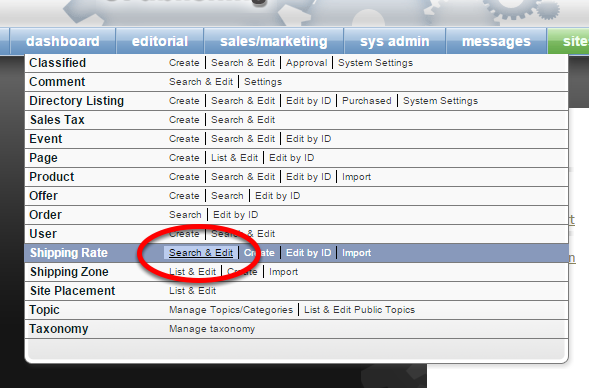 To access existing shipping rates, click on Search & Edit next to Shipping Rate under Sales/Marketing on your dashboard. 2. Click on the shipping rate you'd like to update. Zoom: Click on the shipping rate you'd like to update. 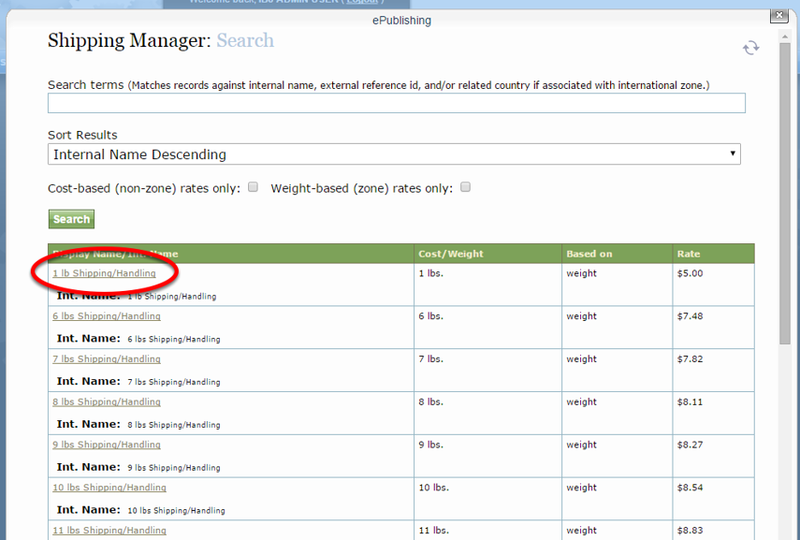 NOTE: ePublishing only supports rates based on weight, not cost. 3. 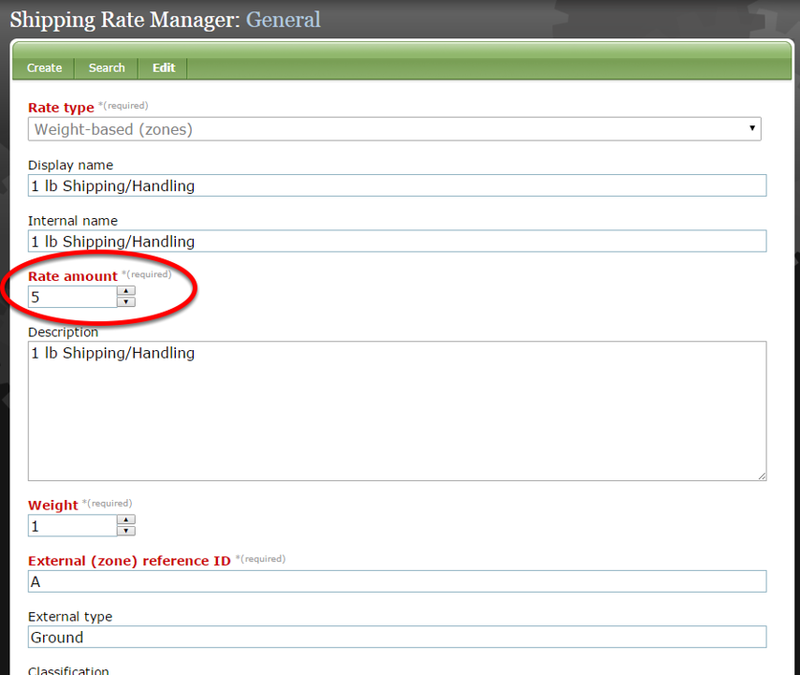 Update the Rate amount by typing in the updated amount or by clicking up or down on the arrows. Click Save at the bottom of the screen. Zoom: Update the Rate amount by typing in the updated amount or by clicking up or down on the arrows. Click Save at the bottom of the screen. The rate is shown in dollars. If you have questions about your shipping zones, please contact your solutions manager. 4. Note: To ensure shipping rates are applied properly, set a product's weight in lbs. and click the box next to Enable Shipping? when editing or creating the product in the Product Manager. Zoom: Note: To ensure shipping rates are applied properly, set a product's weight in lbs. and click the box next to Enable Shipping? when editing or creating the product in the Product Manager. Prev: How do I sell a PDF or other file as a product? Next: How do I add sales tax?